Set in 15-acres beautiful grounds with lawned areasSet close to Largs on the Firth of Clyde, these charming holiday apartments have been carefully converted from the stable block of a delightful Victorian manor house, which is located some 200 yards away along a tree-lined drive. Offering every contemporary comfort and convenience, enjoy the relaxing ambience of the scenic setting. You can relax amid 15 acres of landscaped grounds, or in the lawned areas, which are surrounded by woodland. There are wonderful views of the hills and islands of the Firth of Clyde, and plenty of outdoor activities to enjoy. There are two golf courses, trout farm fishing, sailing, nature trails and pony trekking, as well as cruises aboard the famous ’Waverley’ paddle steamer. In Largs, 2 miles, you will find the Kelburn Country Centre and Vikingar - an exciting all-weather leisure centre, with a swimming pool, 500-seat theatre and children’s soft play area. There is also a choice of small shops, a supermarket, post office, pubs and a station. Although an attractive seaside resort now, Largs like much of this area has enjoyed an interesting history - in 1263 it was where the Norse fleet were defeated. From Largs take a ferry to Great Cumbrae Island and visit the aquarium, near Keppel Pier, and the ’Cathedral of the Isles’ on the sandy bay at Millport. The Cumbraes are not the only isles within easy reach. Go from Wemyss Bay across the waters to Bute, or drive south to Ardrossen and arrive in the exceptionally mild island of Arran. Arran is home to a wealth of places to visit, including the National Trust for Scotland owned Goatfell, 2,866 ft, with its magnificent views from the Clyde coast to the Hebrides and Northern Ireland. Golf enthusiasts will enjoy making the trip here, as Arran has 6 courses in which to shoot a round. Manor Park is well-placed for anyone looking to plan a diverse holiday itinerary. Whether you take to the sea or prefer to head inland, there is much to fill the days. Within an hour’s drive you can reach Loch Lomond, Burns country and Glasgow, with Edinburgh just a little further. Pub 2½ miles.External steps to entrance. All on the first floor. Living/dining room: With TV and Z-bed available on request. 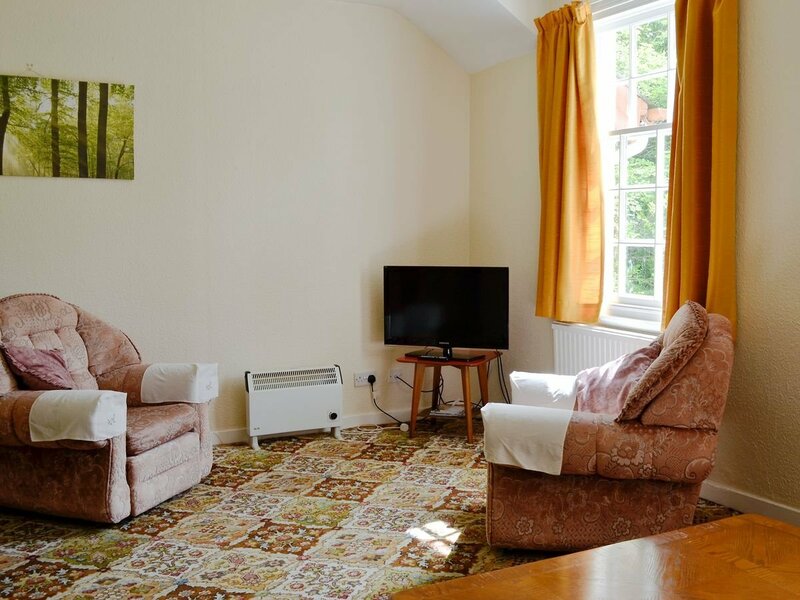 Shower room: With shower cubicle and toilet.Gas central heating and electricity (£45 per week 21st Aug-18th Jun), bed linen and towels included. Cot and high chair available on request. Laundry service. 15-acre garden with garden furniture (shared). Private parking. No smoking. Be the first one to tell us about your rental experience while staying at Manor Park - Strathisla. Let us know if the listing matched your expectations. You can share your comments about the location, property owner/manager and all the unique features that made your stay a memorable one.